Haina in Haida means Sunshine Town, and the village is situated at the end of a small island looking east into the rising sun over Skidegate Bay. Haina was occupied in the late 1850s, on a much older site, by the people of Kaisun (Gold Harbour) and Cha'atl villages. Dawson explains that the reason for the move to Haina was the drastic decline of population in all the west coast towns due to the introduction of diseases like smallpox and tuberculosis by the miners in the short-lived gold rush that Chief Gold and his wife started. The chief whose name means Highest Peak in a Mountain Range stands in front of House Where People Always Want to Go, at Haina. Photograph by Richard Maynard, 1888. 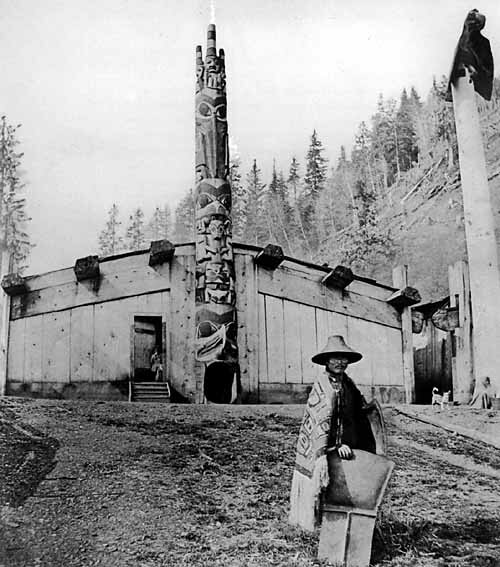 The town chief was Ganai of the Eagle clan, who owned two houses in the village. His main residence was called House Always Looking for Visitors, and the other was Lightning House. On the frontal poles of both houses, the main figure wears an immense hat with alternating light and dark rings, on which sits a Raven. This main figure represents a mythical being who taught the chief the dances of the Dog-Eater Society. Chief Ganai's main house was distinguished by having two oval entrances on either side of the frontal pole, as well as by smaller versions of the dog-eater figure or watchmen on the corner posts. The Raven on the top of the pole ensured that no one overlooked Ganai's wealth, as it held a large copper in its beak. Although the pole of the main house eventually fell down and decayed, the pole from Lightning House is now at the Canadian Museum of Civilization. 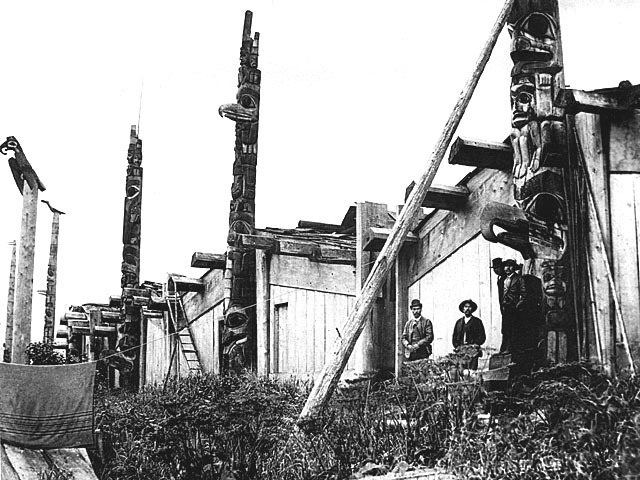 The pole that stood in front of House Waiting for Property belonged to a Raven lineage, and it is also now at the Canadian Museum of Civilization. The top figure is a Killer Whale person flanked by two watchmen. The large beak on the figure below belongs to an Eagle crest, and below that is a tcamaos (a supernatural snag that devoured canoes) grasping a six-section potlatch cylinder emerging from the head of a Whale. The frontal pole of House Waiting for Property (right) was exhibited at the Columbian World Exposition in Chicago in 1893. It has now been fully restored and stands in the Grand Hall of the Canadian Museum of Civilization. Photograph by Richard Maynard, 1884. When I made a very brief test excavation at the edge of one of the house pits at Haina, I found piles of chips of argillite as well as pieces of broken and unfinished argillite carvings. 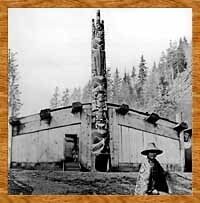 This confirmed various reports that many argillite carvers had lived and worked at Haina, although they may have sold most of their output in Skidegate or Victoria. Haina struggled on through the 1880s, and the inhabitants even built a church, but they finally abandoned the town in about 1890. On this model totem pole, the second figure from the top is that of a shaman holding puffin beak rattles over two patients. Collected at Haina in 1884 by Alexander McKenzie of the Hudson's Bay Company.